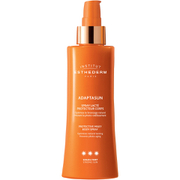 Prepare skin for Moderate Sun exposure with Institut Esthederm Adaptasun Body Spray. The tanning spray is quick drying and is formulated to help skin adapt better to the effects of sun, whilst also activating the skin’s natural melanin process, for a deeper more intensified tan. 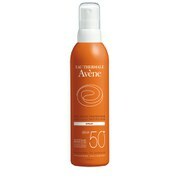 The innovative body spray protects skin against UVA/UVB rays and photo-ageing. Ideal for skin that tans easily and rarely burns. Spray on the body 20 minutes prior to sun exposure. Re-apply every two hours. "Aqua/Water/Eau*, Ethylhexyl Methoxycinnamate, Dipropylene Glycol, Ethylhexyl Salicylate, Propylene Glycol Dicaprylate/Dicaprate, Homosalate, Pongamia Glabra Seed Oil, Cyclohexasiloxane, Butyl Methoxydibenzoylmethane, Ethylhexyl Methoxycrylene, Butyleneglycol, Butyloctylsalicylate, Diisopropyl Sebacate, Hydroxypropyl Dimethicone Behenate, Ceteareth-25, Tocopheryl Acetate, Benzotriazolyl Dodecyl P-Cresol, Steareth-21, Disodium Ethylene Dicocamide Peg-15 Disulfate, Fragrance (Parfum), Creatine, Glycyrrhetinic Acid, Mannitol, Methylpropanediol, Pentylene Glycol, Trilinolein, Caprylyl Glycol, 1,2-Hexanediol, Acetyl Tyrosine, Aspartic Acid, Helianthus Annuus (Sunflower) Seed Oil, Xanthan Gum, Disodium Edta, Hydroxyethyl Acrylate/Sodium Acryloyldimethyl Taurate Copolymer, Sodium Dextran Sulfate, Cyclopentasiloxane, Hydrolyzed Soy Protein, Oleoyl Tyrosine, Squalane, Sodium Hydroxide, Triolein, Tripalmitin, Hydrolyzed Wheat Protein, Glycerin, Linalool, Hexyl Cinnamal, Hydroxycitronellal, Oleic Acid, Medicago Sativa (Alfalfa) Extract, Trilinolenin, Phenoxyethanol, Propylene Glycol, Polysorbate 60, Limonene, Tristearin, Benzyl Benzoate, Geraniol, Bht, Citronellol, Copper Gluconate, Artemia Extract, Carnosine, Isoeugenol, Triarachidin, Coumarin, Disodium Adenosine Triphosphate, Citral, Laminaria Digitata Extract, Potassium Sorbate, Acetyl Hexapeptide-1, Dextran. * Cellularwater(Aqua/Disodiumadenosine Triphosphate/Carnosine/Mineralsalts)"